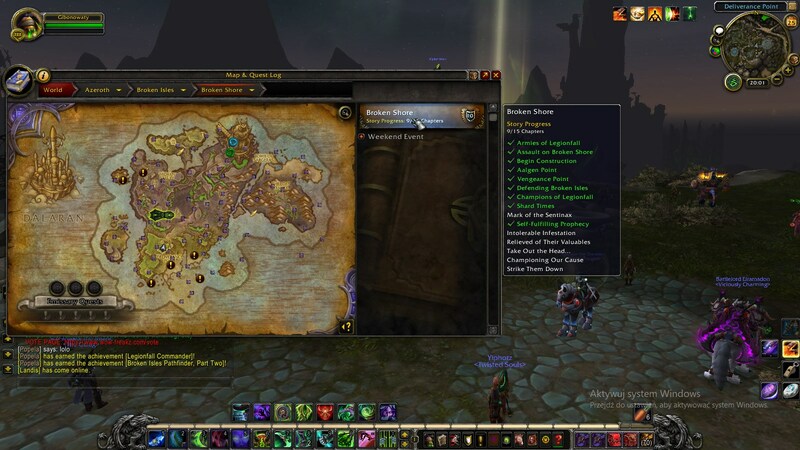 Bug description: After the fix of the cooldown on the questline https://www.freakz.ro/forum/FIXED-Quest-Broken-Shore-All-Breaching-the-Tomb-Cooldown-between-quests-is-non-blizzlike-t553609.html now some mission dont count on your achievement or they count and disapear after daily reset, and obviously you can't take it anymore because you have the next mission. Confirmed. Did every quest on my warlock, currently I'm doing class mount quest chain, however I don't have Breaching the Tomb achievement, nor credit for 4 parts of the Achievement. Also, got reward of 15k Order Resources for quest "Championing the cause" rolled back. I've completed "Mark of the Sentinax" quest, progressed in the Broken Shore questline but didn't get an achievement for "Mark of the Sentinax". Same here,i did the last 3 from campaign quest today,the achiev didnt come ,the quest for mount didnt apear. Confirm, did the same thing but it didn't work out. I think this happens because if you see on the quest helper each quest has an aura of "campaign cooldown''. Even after the fix the aura isn't removed so I think each quest is taking that aura into account. Hence, no quests are completed if you complete more than one each day. With respect to the change of waiting of the missions of "[Breaching the Tomb]" the missions of the achievement disappear of the registry when disconnecting. and they left the one that was completed. Today I finish the entire broken shore campaign and I do not have any more missions. Please help. I can confirm tho. I did with druid today last 4 chapters,it looks like counted,but quest for mount didnt appear. After relogging last 4 chapters didnt counted,no achievement,even reputation didnt count,there was still no quest for mount. So,nice. No rep,no quest for mount,no achievement,and yea,cant re-take the quests. If need screenshots as proof,i can upload it easily. Cheers! Could it have something to do with the fact that some of the chapter get completed before actually fully completing the requirement? E.g., I killed only 2/3 elites and my Take Out the Head was marked as completed. And now it's the only one missing from the meta achievement Breaching the Tomb. My problem seems a little different, yesterday I've completed "Championing Our Cause" (I've done 3 quests in the class hall but not the ones with '!' in front of their name, I've done the ones that happen in Broken Shore, don't know if it has something to do with that, can't show a screenshot because those missions are not available anymore) and right after (where was the 24h cooldown? ), the last quest appeared named "Strike Them Down" (killing 100 mobs), done that as well, I also got my class mount (as you can see in the picture) and logged off. After a couple of hours I logged in to search for the Mage Tower quest (dont even know if that quest is implemented, so I can get that weapon appearance) but apparently somehow "Breaching the Tomb" quest was incomplete because "Strike Them Down" somehow was incomplete, wut ?! I want to add one more problem I see that all the reputation and Nethershard that I got yesterday x5 quest none was saved. Up send a photo of the last mission and with that should leave you practically venerated with the decline of the legion of fragments I have no photos but reputation is easily verifiable.